Justin Timberlake, who just released his new album Man of the Woods (stream it and read our review), will be playing the Halftime Show. It’s his first time performing at the game since the infamous “wardrobe malfunction” with Janet Jackson. JT said that he thought about bringing Janet out again, as well as ‘NSYNC, Jay-Z and collaborator Chris Stapleton, but it looks like his only guest will be his backing band The Tennessee Kids. “I feel like they’re my special guests,” he added. UPDATE: TMZ reports that Justin will be joined by a hologram of Prince. UPDATE: Justin’s performance happened, Prince tribute included. UPDATE: Lionel Richie gets prompted to say “all night long” in TD Ameritrade commercial. A lullaby cover of Nirvana’s “All Apologies” was featured in a T-Mobile ad starring adorable babies. 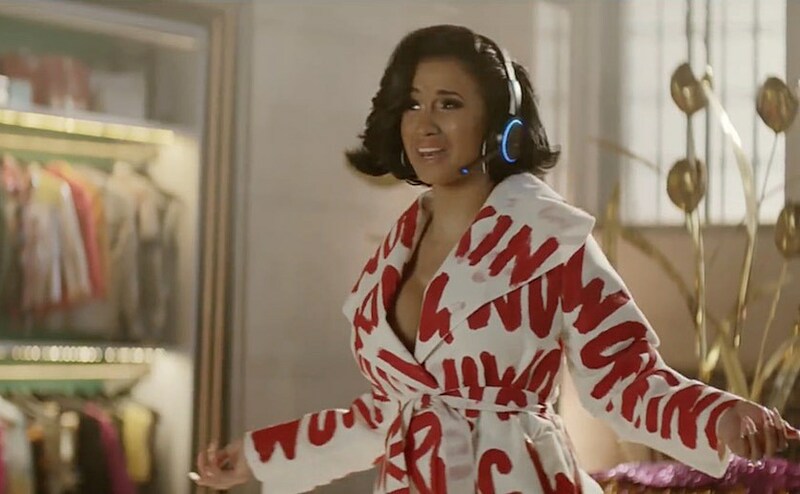 There’s a commercial for the Amazon Echo where Alexa loses her voice, and her role gets filled by a handful of celebrities, including Cardi B, as well as Rebel Wilson, Gordan Ramsay, and Anthony Hopkins. Come for the part when Cardi responds to a request for country music by rapping “Bodak Yellow,” stay for when Anthony Hopkins creeps an Echo user out in a role similar to his Westworld character. In other news, Cardi is teasing a tour with Bruno Mars. There’s a commercial that puts Doritos Blaze up against Mountain Dew Ice, and the ad for these junk snacks is made way better by Peter Dinklage lip-syncing Busta Rhymes’ verses on Chris Brown’s “Look At Me Now” and Morgan Freeman lip-syncing Missy Elliott’s “Get Ur Freak On.” Not only can you watch the commercial now, you can also see a behind-the-scenes video where the rappers teach the actors how to rap their bars. The ad is partially generating some hype for the new Busta Rhymes, Missy Elliott and Kelly Rowland single. Keanu Reeves pokes fun at his own mystique in Squarespace’s fun Superbowl ad which is titled “Make it Happen,” and has him surfing on his motorcycle while blasting ““Adventures in Success” from 1983 high-concept disco curiosity Dancing for Mental Health by fictional artist Will Powers (in actuality celebrity photographer Lynn Goldsmith, and this song was co-written by… Sting). Actor, comedian, and Documentary Now! star Bill Hader (who has a new HBO show, Barry, this spring) is basically sure to be funny no matter what he does, and that includes being blown away that you can combine Pringles flavors by stacking different ones on top of each other. Wow! The classic walking, talking red M&M should be careful what he wishes for.